So the actual return on US treasury Bonds is anywhere from zero up to about 1 percent. This means in effect that one would pay to lend money to the US government. Given that, according to a recent article in Forbes, "The Federal Reserve Open Market Committee (FOMC) has made it official: After its latest two day meeting, it announced its goal to devalue the dollar by 33% over the next 20 years…", it means that if one owns treasury bonds, one’s assets in bonds would not so much fall as plummet. This may explain the Chinese determination to reduce their US dollar holdings and the steady build up of gold. China’s gold holdings doubled in 2011. The estimate is the Chinese bought a massive 490 tons of gold in 2011 from just 245 tones in 2010. In the coming years, the deteriorating US dollar will be worth a fraction of a cent and indeed the prospect of a wheel barrow of dollars to buy the groceries for the week is not as farfetched as it sounds. It means also that gold is better than bonds. True holding gold bullion or coins does not make any interest, but at least it keeps its value and you can still buy the same bag of groceries with the same amount of gold now as you could many years ago, something that cannot be said for the dollar. The catch phrase, 'Buy Gold' is coming into its own and now takes on a new meaning. People are buying gold like it is going out of fashion. Banks and institutions are buying gold. States and countries are buying gold. It’s time to protect ones assets. 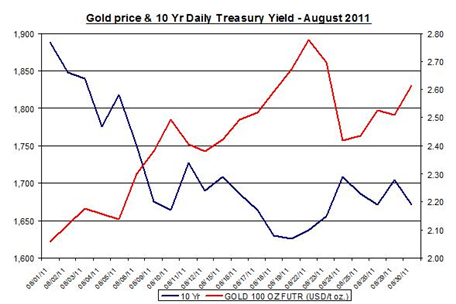 Gold is, indeed, better than US treasury Bonds.